Timothy Green is an American poet. I received my electronic version of Rattle #44 today. My poem “La Campagna, London, Friday Night” appears in it, alongside poems from fellow Pacific University MFA Alumni Daniel Bohnhorst and Kathleen Diane Nolan as well as an incisive political poem by Transatlantic Poetry’s own Janice D. Soderling. Rattle remains one of my favourite US journals — accessible but thought provoking, enjoyable but complex. Editor Tim Green takes risks, which means that invariably I can find a poem that I adore and another that I can hardly stand all within the same issue. He continues to push the envelope with a new weekly initiative featuring poems written in response to current events on the Rattle website. This week’s poem is a hard-hitting response to recent news and online conversations about violence against women. 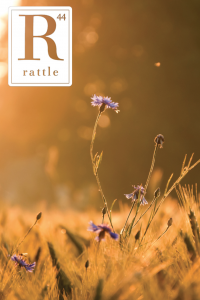 You can order Rattle #44 or subscribe online via their website. It was with great excitement that I drove down to Frank Pictures Gallery in Bergamont Station to read poems alongside Tim Green, Nikola Madzirov, and Ilya Kaminsky last night. It is always a privilege to read alongside first-rate poets, but last night was something truly special. It was one of the final readings in the “Third Area” series to be held in this gallery, and my final reading in America before Val and I move to London. But more than this, the lineup was particularly special to me. I was slated to read with Tim Green at the Carnegie Art Museum last year, but it ended up being too close to the due date of his new baby daughter. He read poems from American Fractal as well as some new work. Tim has been a great supporter of my own work, giving it exposure through Rattle, and is himself a fine poet — sonorous and absorbed when he reads, self-deprecating and down-to-earth in between. Then I was introduced to the work of Macedonian poet Nikola Madzirov, available now in English thanks to BOA editions and the Lannan Translations Selection Series. His poems took my breath away. In them, I found many of the elements of what I admire most about other Slavic-language poets, especially those far to the north in Poland — sensitive, clever observations, at times whimsical, but always with a deep undercurrent of existential longing. Timothy Green recently sent me an advance copy of his debut book of poems, American Fractal . I helped him out a bit when the Rattle website was having some technical trouble, and he, in turn, sent me what I discovered, by the inscription, was only the third copy of this book he has signed so far. What follows, therefore, is one-part public thank-you-note, one part book review. One of the things I love about this book is that Green is not afraid to rhyme — both internally, and at the ends of lines. Heeding the ominous warning at the front of the book not to reproduce any part of its contents without permission from both author and publisher, I will have to leave it at this: the rhymes work. Green is not afraid, like Ashbery or Stevens, to follow a line with something wild and unexpected. Rhyme, repetition, and stanzaic integrity (à la Doty) all work to counterbalance this wildness, giving a sense of cohesion and satisfaction to his by turns whimsical and serious assemblage of disparate perceptions. This is a book, after all, about chaos and order — as is boldly announced in the opening quote by Douglas Hofstadter — the Feynman-like cognitive scientist after whom several recursive geometric sequences have been named. Hence, the fractal, present in form as a wild kind of order. But although the other word in the title — “American” — provides the content for this fractal-scape, Green is not a pop-culture poet. Though unafraid to reference the modern world, his work does not cash in on the currency of the currently-well-known. Instead, these poems find their source in a meditative place, even if that meditation is upon a man who dies during a video-game binge, or auctions his forehead for advertising space. It is upon Green’s keen perception — both internally and externally — that the success of his best poems rests. Here is a first book by a poet younger than me that is confident and sage, but hardly predictable. These poems work together and alone to pull us deeper into the saturnalian possibilities of the well-observed mundane, giving us, in the end, as he says in “Hiking Alone” — my favorite poem of the collection — “all we / ever wanted: a little darkness to climb out of.” (OK, I couldn’t resist quoting just a little bit.) Preorder your copy from one of the author’s preferred retailers, and let that special contemporary-poetry-loving someone know that Santa is bringing them a tardy present that is sure to be worth the wait.